Helping those affected by injury - together. We can’t always plan for what life has prepared for us. 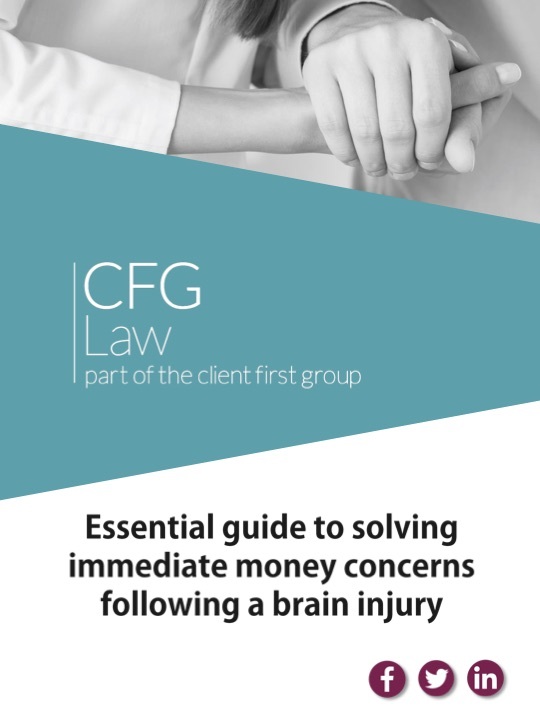 Here at CFG Law, we know how traumatic and financially demanding the aftermath of a brain injury can be to a family. In this download, we provide all the information you need to quickly identify the funding and financial help available to you in such a moment of need. Simply fill in the following details to download your copy. The different types of benefits and government support available to you. Ways to obtain help with covering health costs for your loved one. Ways to access emergency funds to cover immediate needs. How claiming a compensation can help you alleviate your financial strain and provide you with long term financial stability. Why choosing the right solicitor is crucial. At CFG Law, we are specialist serious injury solicitors with over 30 years’ experience and a track record of success in handling high value and complex serious injury claims. Our team of team of 70+ specialist lawyers and support professionals share a common purpose: to help those affected by injury - together. We work with healthcare professionals and insurers to help our clients reach a place where they can live as fulfilling and financially secure a life as possible. By making a claim with CFG Law, you will receive the support of a multidisciplinary team including both a Serious Injury Solicitor and a Client Support Manager (highly experienced Occupational Therapists and Physiotherapist). Our Client Support Managers will assess your needs from day one and work to provide the support you and your family need immediately. We have found the team to be very supportive and attentive. The friendly support provided has made the whole process so much easier for us. CFG Law is a trading name of Freeclaim Services Ltd. Legal 500 Recommended. Authorised & regulated by the Solicitors Regulation Authority. SRA number 469926. Registered office: Oakwater House, 4 Oakwater Avenue, Cheadle Royal Business Park, Cheadle, SK8 3SR. Vat no. : 165 6116 10. Subject to normal terms and conditions. All calls to our 0800 numbers are free of charge.